I could leave it there, but I’m a writer. Leviathan by Scott Westerfeld is the first book I’ve read to completion on the nook. In spite of the nook’s irritating tendency to lock up when I’m showing it off to interested passers-by, the nook reading experience was effortless, comfortable, and just plain cool. Dark Omen actually read Leviathan before I did, also on the nook. He liked the light weight of the reader (he’s used to those heavy library-bound hardbacks), and enjoyed the gadget aspect. Mostly, he enjoyed the story. And he’s taken to sporting a knit cap he says is a Bowler Hat. 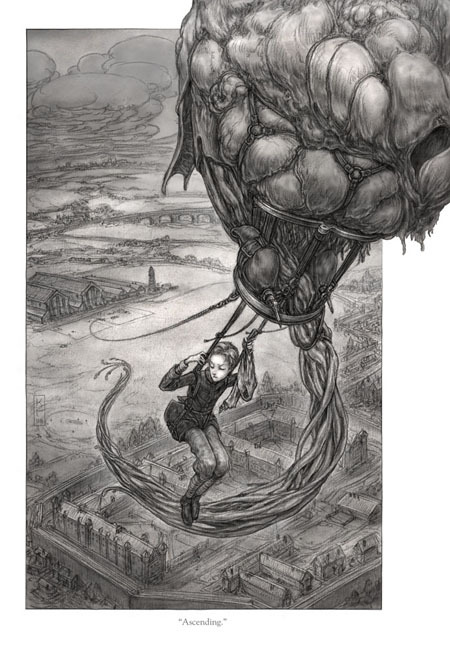 Leviathan is marketed as an upper middle grade steampunk adventure, although the protagonists are 15-16 years old. Deryn is a girl who disguises herself as a boy so she can join the Air Service in 1914 Britain. Prince Aleksander is the half-royal not-heir to the Austro-Hungarian throne who struggles with duty and survival when the assassination of his parents pitches the world into war. Their paths collide and Westerfeld’s fast-paced action doesn’t disappoint. Oh, and there’s Darwinist creatures pitted against Clanker machines, and the technology is a delicious mixture of retro steam and futuristic custom-designed creatures. Scott Westerfeld’s fantastic imagination, combined with Keith Thompson’s gorgeous line drawings, creates a feast for the mind and eyes. The only drawback to this book is its ending: curses upon Westerfeld for his cliff-hanger books! 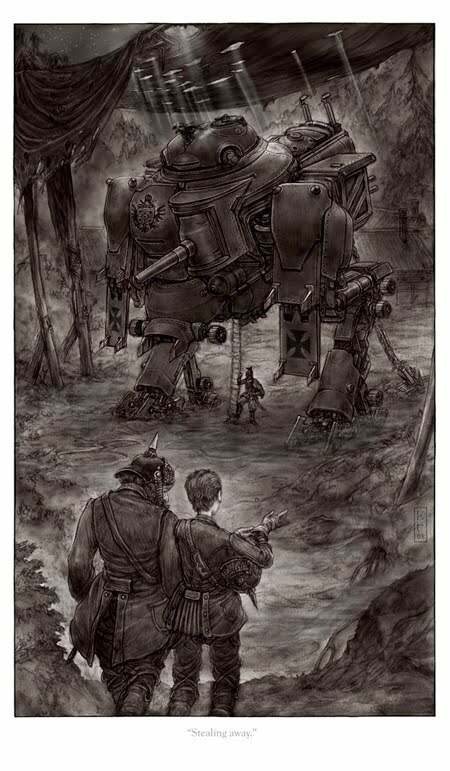 You must read the next book Behemoth, but it doesn’t come out until October 2010. Westerfeld says he will probably tour when Behemoth is released, so I may have to stalk him. The only question: how do I get my e-book signed? I might have to resort to having him sign something else. Maybe that collectible Leviathan art that would really look awesome on my wall. Westerfeld writes smart and very clean books. The violence is real, but not gratuitous, and almost completely bloodless. There is death in Leviathan. This is war, after all. Alek accidentally kills a soldier, and Deryn is involved in a couple battles where fatalities occur. The dead are hinted at, but not described. Unless your child is very sensitive to such things, Leviathan is an excellent book for advanced readers ages 9+. Westerfeld is quickly becoming one of my favorite modern authors. I read his teen book Uglies, a dystopian study of a world where everyone is made Pretty at age 16. Although Uglies is definitely a teen book, due to its teen protagonists and their teenaged concerns, it is again a very clean book – chaste kisses, little or implied violence, and fantastic storytelling. I could easily recommend this book to pre-teens ages 9+, especially due to the very positive messages it has for girls about the importance (and not) of beauty. I will be shocked if Leviathan isn’t made into a movie. It is action packed and has “summer blockbuster” written all over it. Now if I could just get my own messenger lizard. Here’s the book trailer for Leviathan, to whet your appetite. That's a really neat book trailer. And it seems like a really good book. I'm not much of MG reader, but this has me interested. The best MG and YA books have a broader appeal, I think, than just their young target readers. Leviathan has a bit of everything to appeal to a spectrum of readers – cool tech for the SF geeks, retro-history for the history buffs, action and adventure and spunky protagonists for everyone. I hate cliffhangers, but I love good books. And that is one sweet trailer. Bane – I love the idea of book trailers. Some are gosh awful and some are fabulous. I totes want to do one when my book gets published (note the positivity? :), but only if it won't be cheestastic. I hope you will check out the Enchanted Forest Chronicles by Patricia Wrede. They are a delightful twist on the old "princess in distress" idea. In the first book, Cymorene is a princess who gets punished for not wanting to learn embroidery…instead, she gets the royal fencing instructor to teach her his skills, and the royal cook teaches her how to make cherries jubilee. When a prince is chosen for her by her parents, she runs away, following the advice of a frog who speak to her from the pond out back of the castle. She goes to a cottage and discovers dragons, who like to kidnap princesses to clean their caves and cook for them…only problem is the princes who always come to rescue them. Cymorene volunteers to go with a female dragon named Kazul, because she'd rather be with a dragon, than a boring, vapid prince chosen by others for her. Then when the princes show up to rescue her, she has trouble convincing them that she's happy living with a dragon and doesn't need rescuing! There are 4 books in the series, and enough action and amusing adventures that my 3 boys enjoyed them as much as my daughter. They were published about 25 years ago, I think.